In seeking ye shall find. In the experience of each soul that has named the name of the Christ, this [Easter] should be a season of rededication of self as being a true messenger of His in and among men. Pachamama is a goddess revered by the indigenous people of the Andes. 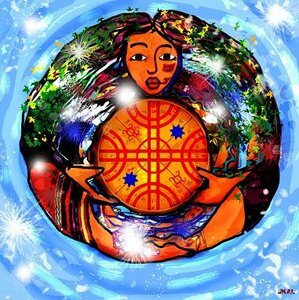 Pachamama is usually translated as Mother Earth, but a more literal translation would be "Mother world" (in Aymara and Quechua mama = mother / pacha = world or land; and later widened in a modern meaning as the cosmos or the universe). Pachamama and Inti are the most benevolent deities; they are worshiped in parts of the Andean mountain ranges, also known as Tawantinsuyu (the former Inca Empire) (stretching from present day Ecuador to Chile and northern Argentina being present day Peru the center of the empire with its capital city in Cuzco). In Inca mythology, Mama Pacha or Pachamama is a fertility goddess who presides over planting and harvesting. She causes earthquakes. Her husband was either Pacha Camac or Inti, depending on the source. Llamas are sacrificed to her. After the conquest by Spain, which forced conversion to Roman Catholicism, the figure of the Virgin Mary became united with that of the Pachamama for many of the indigenous people. Since Pachamama is a "good mother", people usually toast to her honor before every meeting or festivity, in some regions by spilling a small amount of chicha on the floor, before drinking the rest. This toast is called challa and it is made almost every day. Pachamama has a special worship day called Martes de challa (Challa's Tuesday), when people bury food, throw candies, and burn incense. In some cases, celebrants assist traditional priests, known as yatiris in Aymara, in performing ancient rites to bring good luck or the good will of the goddess, such as sacrificing guinea pigs or burning llama fetuses (although this is no longer common). The festival coincides with Shrove Tuesday, also celebrated as Carnevale or Mardi Gras. Plant something today, tomorrow, this week. Do some Guerrilla Gardening. Go ahead I dare ya!